Three years ago, wanting to cause a commotion, as he called it, Seth and I teamed up to write a post about metal detecting here. That post remains one of my favorites. Seth at age fourteen is still an avid treasure hunter, and spends countless hours out with his metal detector. He has learned an incredible amount of history over the years, and often carries his finds to the Civil War museum down the road from us to chat with local historians. 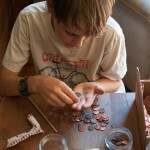 Honestly, I don’t know what this kid would do with himself if it weren’t for his metal detecting hobby. His first detector was a Garrett Ace 250, and he was able to upgrade to his beloved At Pro about a year ago. When friends ask what metal detector we recommend, we always suggest the Ace 250 for kids roughly ten and up (it’s an adult-sized machine, so they have to be tall and strong enough to handle it.) Seth has been bugging me to take pictures of all his favorite finds using his AT Pro, and this weekend we did just that. I added all the photos to this post, and then he added his own text. I guess my next big project is going to be helping Seth start his own blog, because clearly he needs one. The rest of this post was written by Seth, so if your kids or grandkids are interested, please share with them! There is lots to learn here. In the past year I have found 87 wheat cents, I guess my AT Pro likes them. Wheat cents were minted between 1909 and 1958. The dates on mine range from 1912 to 1958. I don’t have every date between those years though. The first coin I found with my AT Pro was a 1919 wheat cent. I think it’s pretty cool that the first coin I found with it was 95 years old! 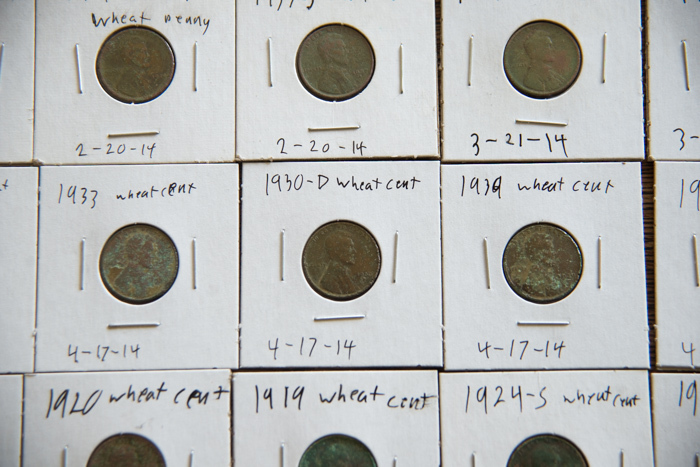 Here is a close up of some of the wheat cents. Since I am organizing the coin section of this post by denomination,my Indian head cents and two cent piece come next. 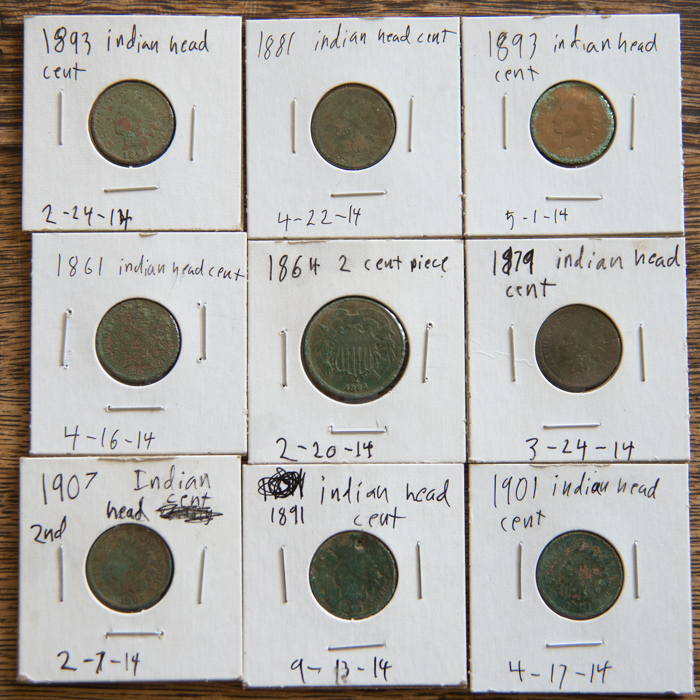 I’m sorry it is so hard to see any detail on the Indian head cents, but they have been sitting in the ground for over 100 years and that is a long time to sit and corrode. The 1864 two cent piece in the center of this picture is probably my favorite find of the year. It’s pretty cool (in my opinion). Here are the reverses of the coins in the picture above. Here is a close up picture of my favorite find of the year, my 1864 two cent piece. This picture shows all the v nickels I found. It took me two and a half years to find one. 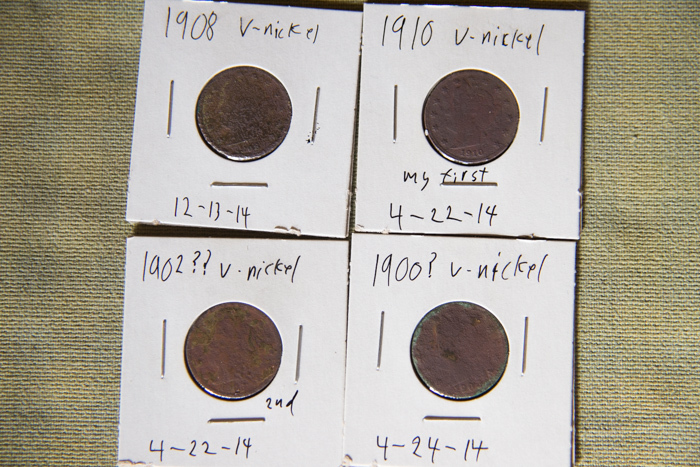 V nickels are named after the roman numeral “v” on their backs, representing five cents. When these coins came out in 1883, the word “cents” wasn’t present on the back, and some people gold plated these coins and passed them off as the new five dollar gold piece. This led to the word “cents” being added to the back in mid 1883. 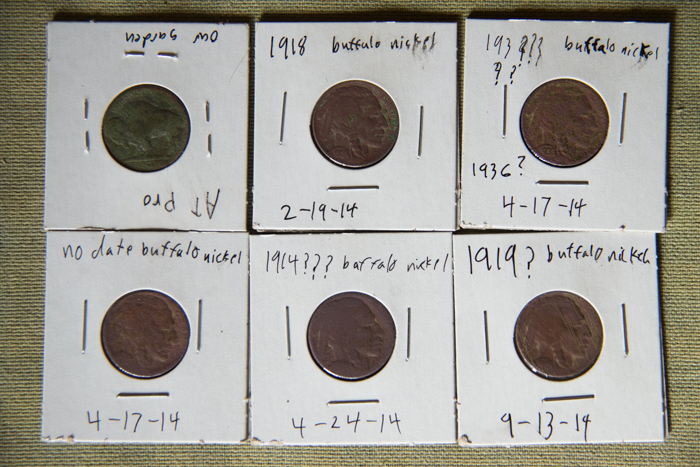 I found six buffalo nickels this past year, most of them being older dates (the one turned over is a 1921). Most of the coins (peace dollars, walking liberty half dollars, standing liberty quarters, and mercury dimes) minted during the time period that these were made in had very detailed pretty pictures on them and the buffalo nickel is no exception. 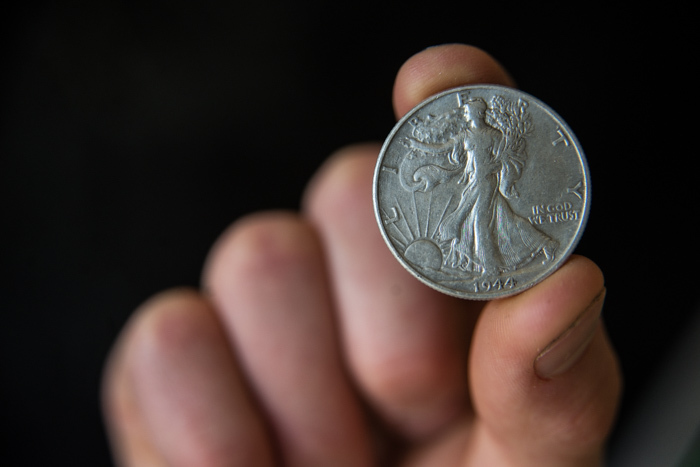 The buffalo nickel, along with the standing liberty quarter,were designed with the date higher than any other point on the coin. This was fine except for the fact that the date would wear off, leaving a dateless coin. Allright, it’s about time for some silver! These coins are the best silver coins I have found since getting my AT Pro. In the top row are the Barber quarter and Barber dime I found ( both worth about 40$, not that I would ever sell them or any other find I have) along with the 1771 cut Spanish Pistareen. I got lucky with the Pistareen. The last two digits of the date were on the piece I found meaning it was minted in 1771, my oldest coin by 90 years. Coins like it were cut to make change, I guess they didn’t carry many smaller coins. 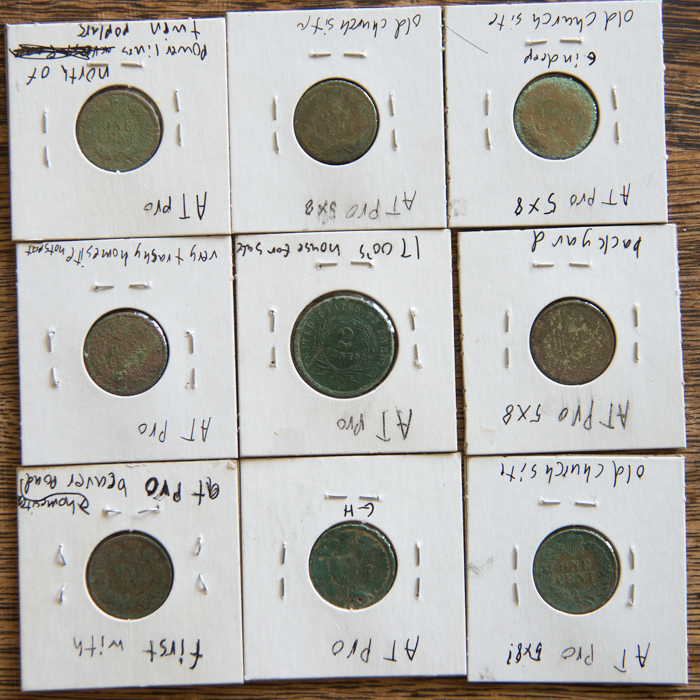 Spanish coins ( and other foreign coins ) were actually legal tender in the U.S.A until 1857. In the center is my favorite silver coin for the year, the 1944 walking liberty half. I think it is a very pretty coin design, too bad they don’t make them any more. In case any one is wondering why there are three modern looking quarters in this picture, I’ll tell you why. 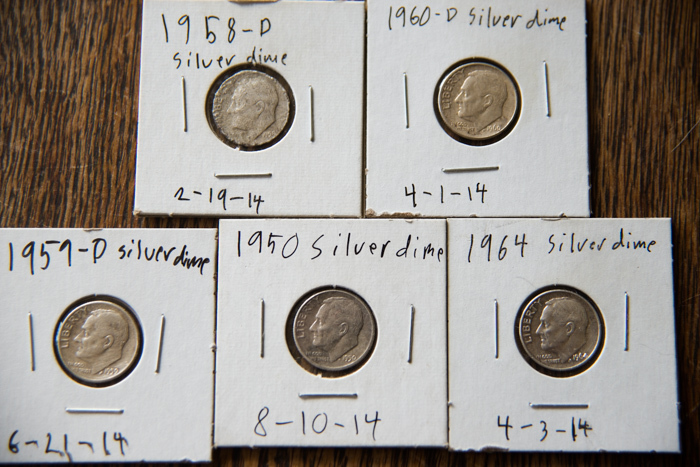 All U.S. quarters, dimes, half dollars, and dollar coins made before 1964 were made of 90% silver. I’m sure everyone knows what the back of a Washington quarter looks like, so this picture only shows the older coins. Here are all those wheat pennies again,after I had pushed them out of the way to take pictures of other things. 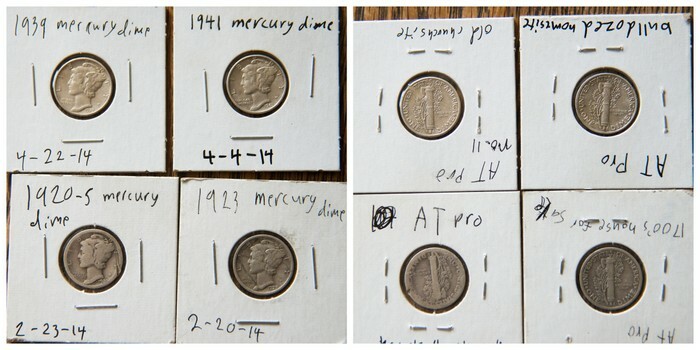 These are all the mercury dimes I found. This was the design of dime used before the current Roosevelt dime was introduced. I like it much more than the current design. 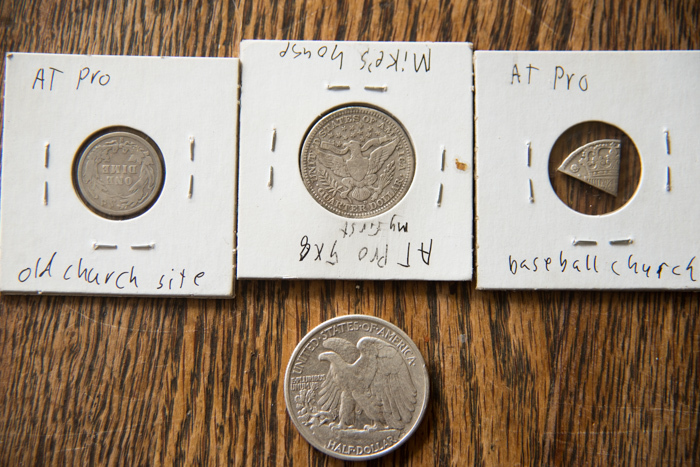 The 1958 silver dime in the picture above was the first silver coin I found with my AT Pro. I thought that I had found all the coins on our property, but found the 1960 silver dime under the bushes next to our house. Finally! I’m finished with coins. My mom told me after she had taken all the coin pictures I wanted that there were only 300 pictures of coins on her camera (sarcastically of course). I’m sure some of you are pretty bored with them by now, so lets move on to something else. This is all the better non-ring jewelry I found. No gold yet, this is all silver except for the earring in the upper left corner which I think is palladium. Oh,wait, I forgot the clasp on the (silver) tin man is marked 14k so I guess I have found some gold after all. 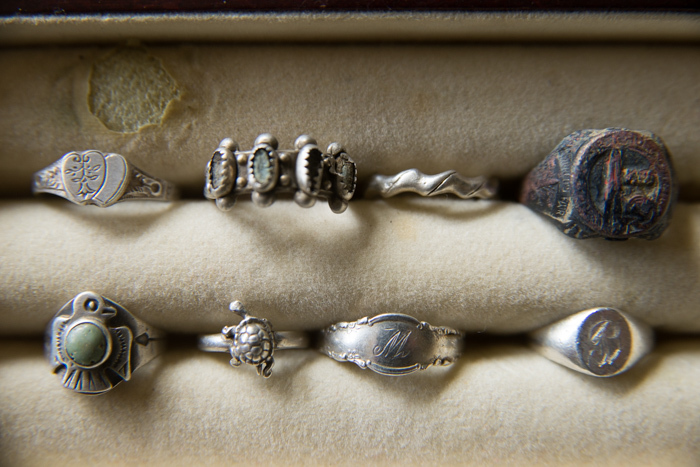 Here are all the better rings I found, seven are silver and the other is copper and is marked world’s fair. 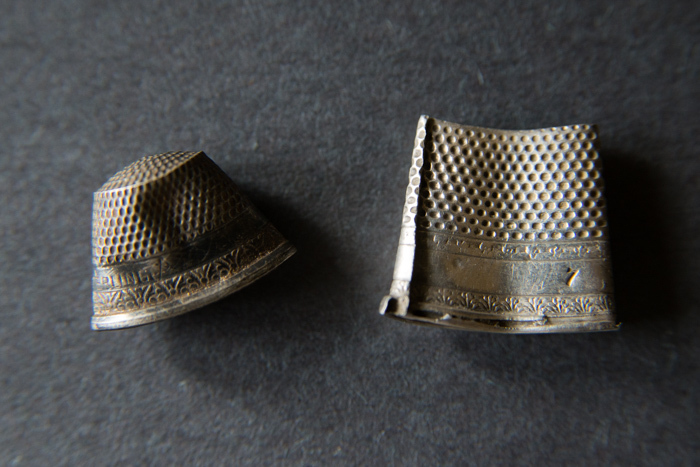 These are two silver thimbles I found, the one on the right was actually laying on top of the ground and I think it is the older of the two. Now for some Civil War relics. 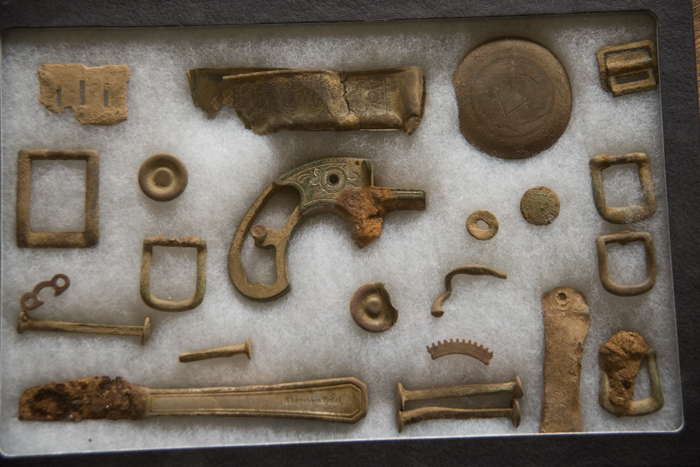 The large buckle in the center is a carbine sling buckle,probably my most valuable find to date. 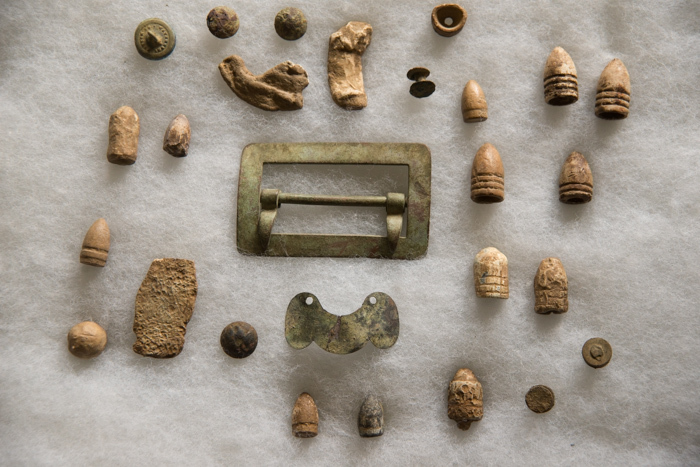 In the lower left corner there is a piece of flattened lead, actually a Civil War bullet a soldier chewed completely flat. The piece of brass below the buckle is a piece off an epaulet or shoulder scale. These relics were all found within walking distance of my house. 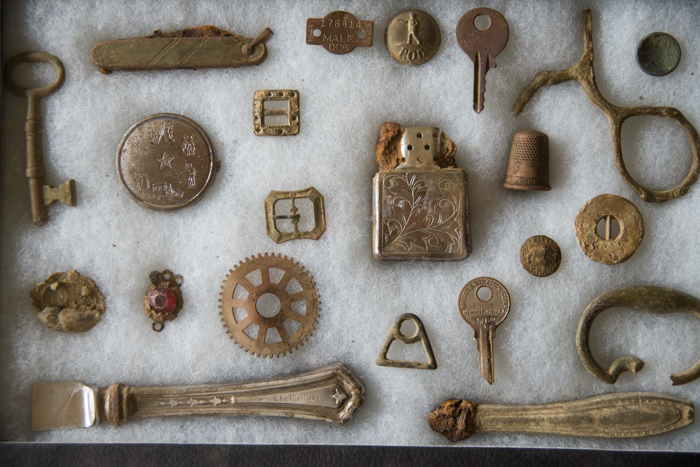 The relics shown in this picture are a mixture of Civil War and earlier items. 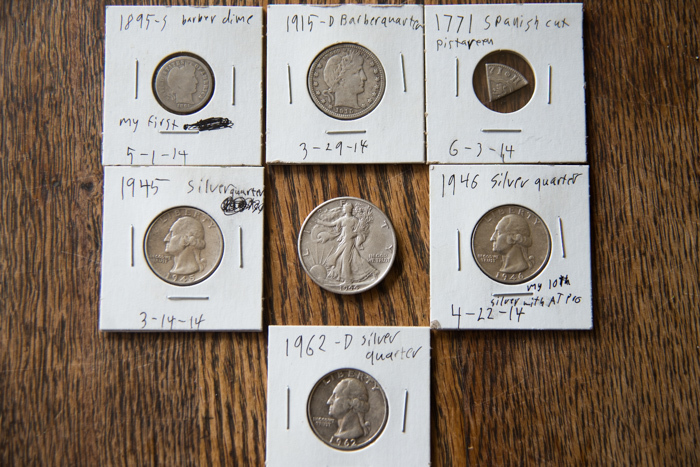 They were found at my secret spot were I also found many other things including the piece of Spanish silver, and the walking liberty half dollar. The cone shaped piece of brass in the upper left center is a bayonet scabbard tip. The broken, upside down button in the center of the picture is probably pre-1800. 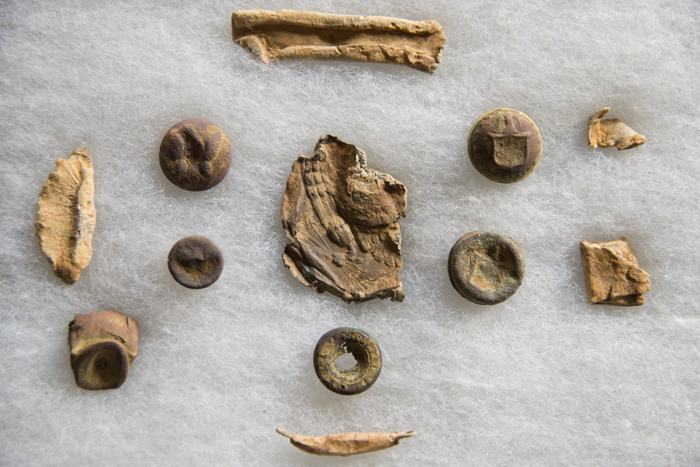 Here is a close up of the civil war buttons in the previous picture, the upper one is a New York state seal button, and the others are general service eagle buttons. 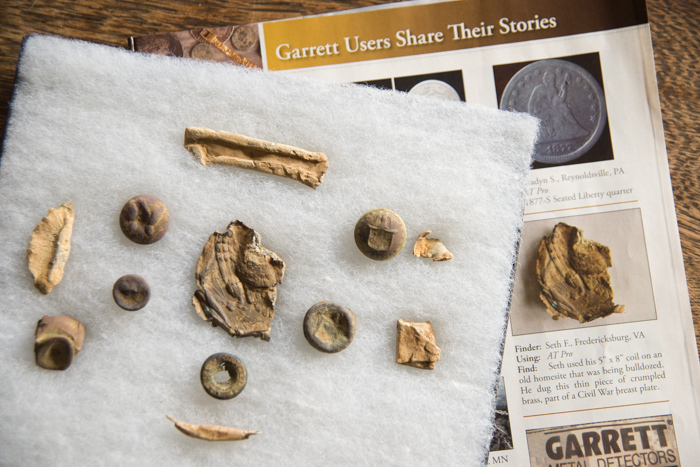 Here are a few more relics from near my house, as you can see, the Civil War breastplate fragment in the center of my case was featured in the Garrett searcher newsletter! Here is a better picture of the relics shown above. On the right are the fronts of two New York state seal buttons, and on the right i a coat-size general service eagle button, and a cuff size general service eagle button. 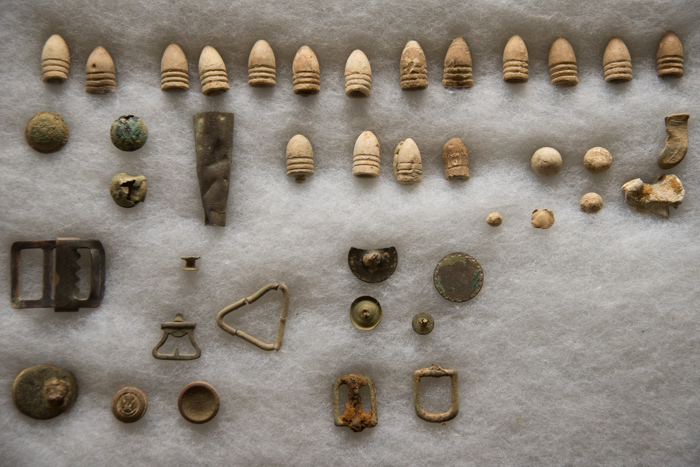 In the center, beneath the breastplate fragment, is the back to a Civil War button. Too bad it doesn’t fit either New York button. 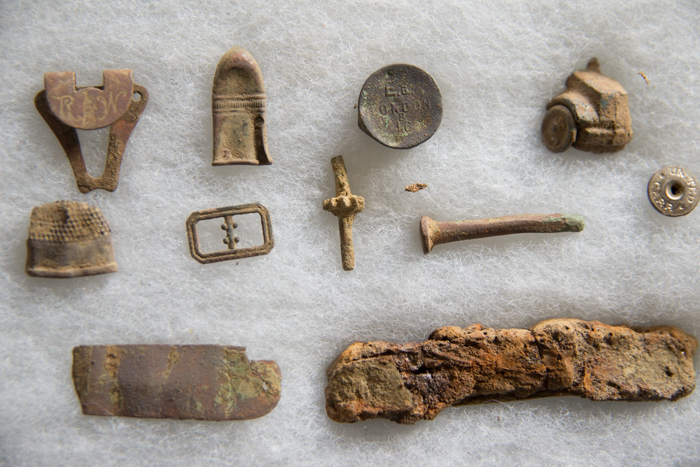 The Civil War relics shown in the previous picture were found on a hilltop near an old home site that I think is more recent than the Civil War. 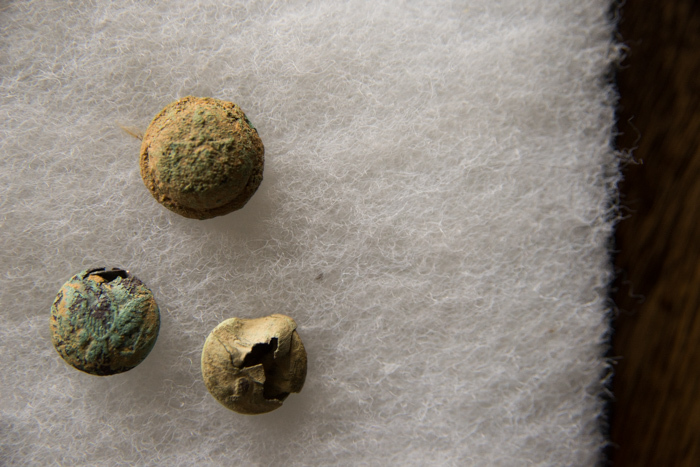 These relics were found with those Civil War relics and related to the old home site and not the Civil War. These relics were found in my backyard and at home sites in the woods around my house. My favorite find in this case is the post office department button in the top center of this picture. These are probably my favorite buttons to find. I have only found three since I started metal detecting and they were all found at the same site. Pretty easy to guess the job of whoever lived at that home site. 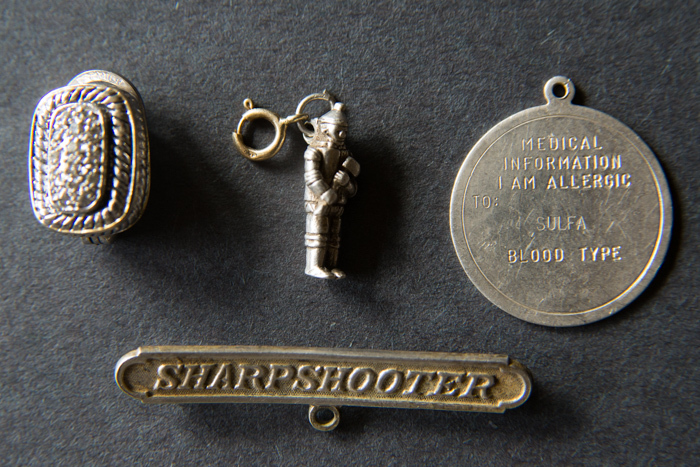 A few other notable items in this case are the skeleton key,and the 1941 Virginia dog license. That sums up my best finds with my AT Pro. p.s. Does anyone know what this relic is? I haven’t been able to identify it. Just reading backwards and I remember your first post. Pensacola Fl is the city of five flags and I am sure you could find interesting things here but I am not quite sure where one would begin. My friends son just recently graduated college locally and they actually have a program for archaeology and have digs in our downtown area for the students. All very interesting. 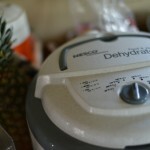 Some of the things you have I might have completely overlooked!! 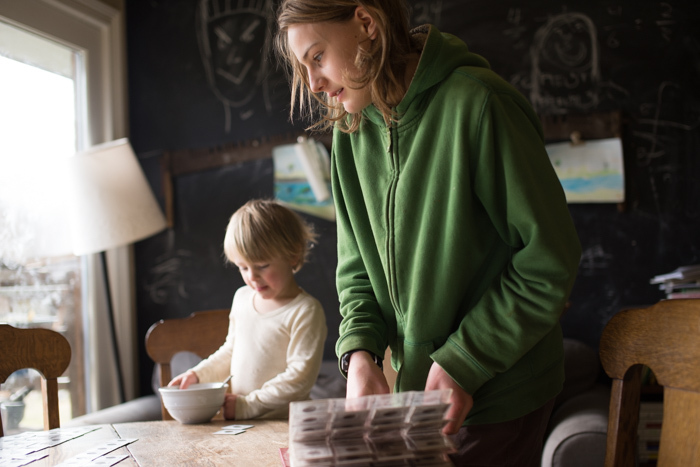 I remember my sons being your age and homeschooled. My father gave them a metal detector and they spent many an hour out in the woods with goats trailing behind them as they hunted for treasures. Thank you so much for this post, Seth. I agree that the walking Liberty is a beautiful design. It is too bad it isn’t still produced. I wonder how inflation is going to limit the ability of people such as yourself to use money to tell stories about history. One of my professors in college was an expert in numismatics of the ancient world and he brought images of coins in to our classes to teach us about the mundane aspects of ancient life. I’m sending this post to my nephews and niece. They have a metal detector and live in New England. I know they are going to want to visit southern areas for metal detecting once they see your awesome Civil War breast plate! 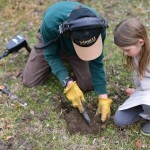 Where they live, it is actually better for metal detecting because of all the colonial history. There are more 1700’s homesites around there. The oldest I have found was probably from the 1920’s. What a lovely collection ! Incredible all these objects you are bringing back to life. Wonderful hobby ! Wow. Thanks for your sharing your finds with us. I love old coins. The walking Liberty is my favorite in your collection. It is a beautiful coin. I wish they still made them too. My collection is not near as big as yours AND I only find them while looking through piles of change that I get. My oldest penny is 1907, I have a nice mercury dime and only one buffalo nickel. Thank you for sharing. I really like the Thunder Bird turquoise ring too. I think it is the nicest one of your rings. Thunder Bird and turquoise have special meanings to the native Americans. Amazing post, I loved this! Thank you, Seth for sharing your treasures and all the information and history that goes along with it. 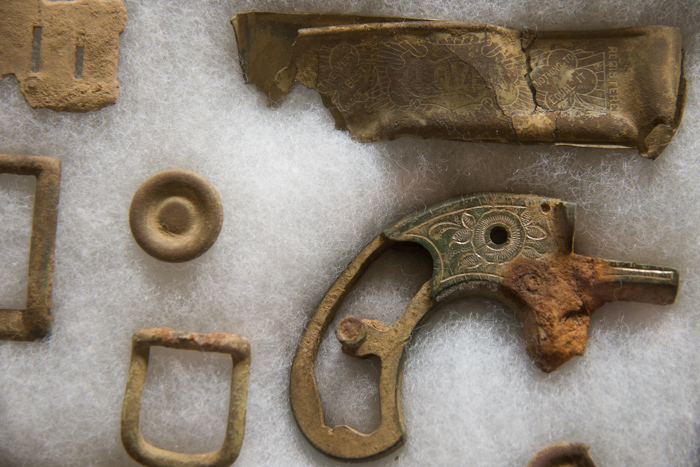 I grew up in Alaska and it’s so hard for me to imagine finding Civil War relics in your own backyard. Fascinating. Wow, this is so interesting! What amazing finds even close to your home. It really makes me wonder what’s hidden in the ground around where we live. 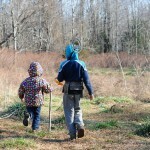 My husband once found an iron age tool in one of the fields when he was a boy, but we’ve never done any metal detecting. I think in particular my oldest son would really enjoy it – might have to look into getting him a metal detector for his birthday. 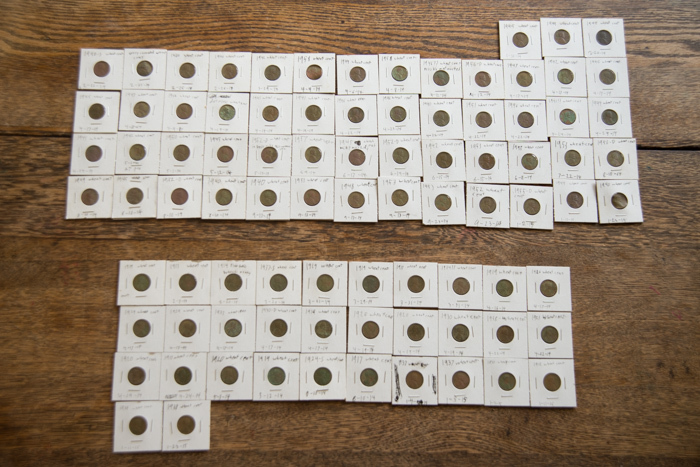 Thanks for this post Seth, it’s been great to read about all your finds! I have a pair of silver earring studs that matches your silver turtle ring! The turtle design looks exactly the same to me. Since I bought my earrings at a Navajo tourist trap market near Four Corners in either New Mexico or Colorado, I’ll bet that specific turtle design is very common. The earrings aren’t valuable monetarily, but they are among my favorites just for the memories. I’m glad you posted that particular photo. Fascinating history. Fantastic job Seth. This is all fascinating! It is fun too see all the bits of history that surround us…so neat that you are able to find these things and figure out what they are and where/when they are from. I look forward to updates on your finds! Hi Seth! Greetings from Northern Ontario! 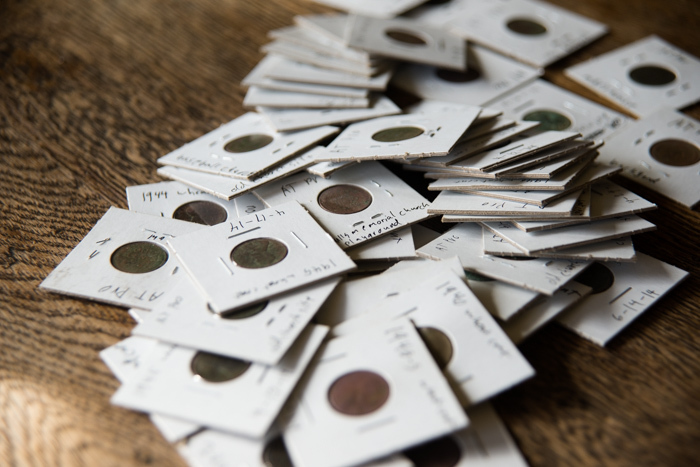 I really enjoyed looking at the wonderful pictures of your finds–what an amazing collection of treasures. I also loved reading their descriptions and am so impressed that you are able to identify all of these relics! 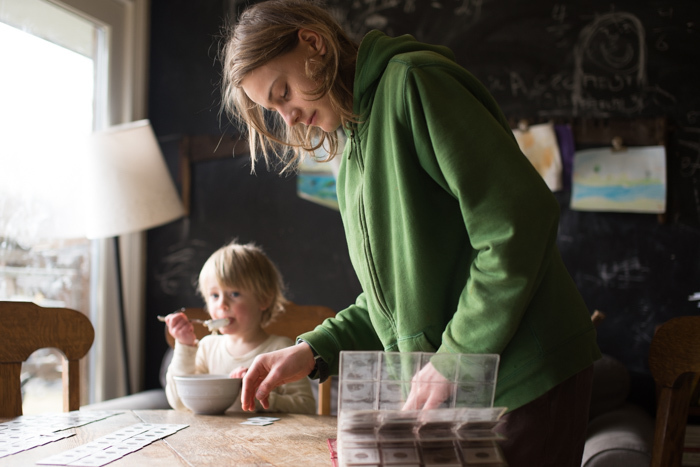 Wishing you continued good luck with treasure hunting! My sons are 9 and 6 they love this post!! They are so excited by your collection. We live in Washington state so we do not have that type of history here. Magnificent! Seth – Thank you for a great post! My 12 year old son, Alex, really enjoyed seeing all of the items that you have found over the years. He has always wanted a metal detector (think we had one from a garage sale once that broke pretty early on!) so this post really inspired him! 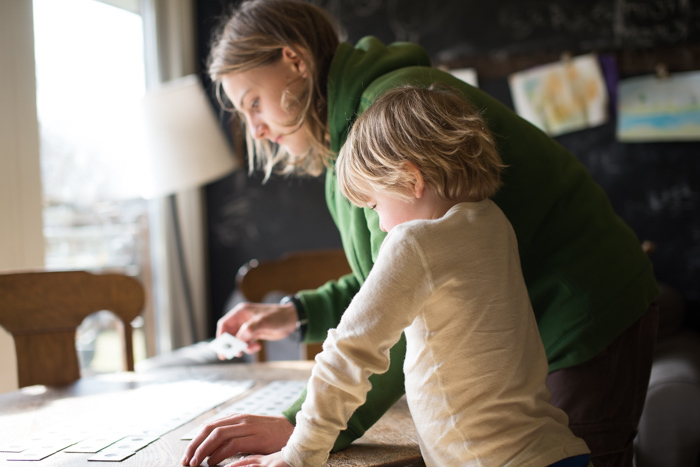 We homeschool too — and really appreciate your taking the time to share your passion! Wow, super interesting post! 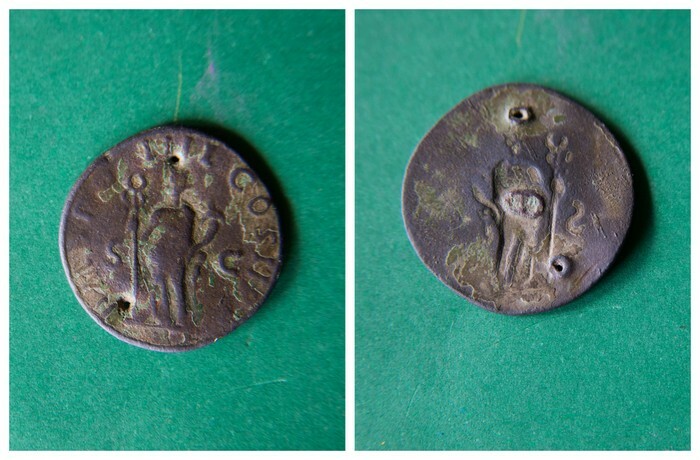 Sorry if someone already covered this, but in addition to the suggestion that your mystery item is a copy of a Roman coin (agree), I was able to find this about the design/figure in the centre: It looks like it’s the Roman god Felicitas, who is pictured on Trajan coins, and who carries a caduceus and a cornucopia. “By extension of its association with Mercury and Hermes, the caduceus is…recognized symbol of commerce and negotiation,” (from Wikipedia) so that would make sense as to why it’s on a coin. 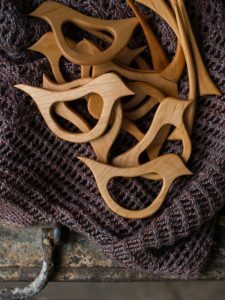 Ditto for the meaning of cornucopia, which means abundance. This page shows a lot of ancient coins, and I think yours looks a lot like the third from the bottom of the “dupondii” section: http://tjbuggey.ancients.info/Trajae.html The main website of this person (Dr. Tom Buggey) looks fascinating, and has a whole section on Trajan coins: http://tjbuggey.ancients.info/index.html (Trajan was Rome’s emperor in 98AD) What I find odd about the suggestion that it might have been used as a button is that the holes are offset, you would think they would have been punched evenly. 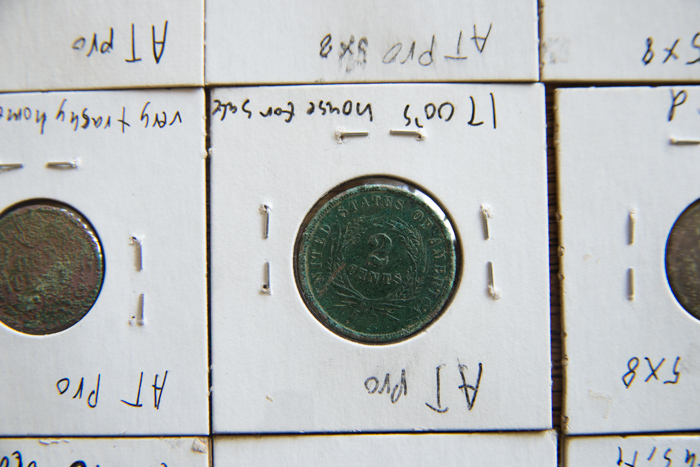 You might have fun trying to research who would have used a copy of a Roman coin way back when? Did men use them on their coats? Did women have them on hats? 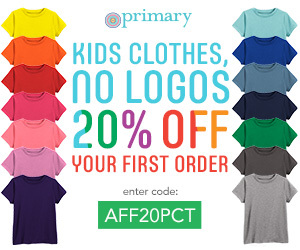 Did children use them in games? Hmm. You have a very fun mystery on your hands, good luck! LOVE the post. 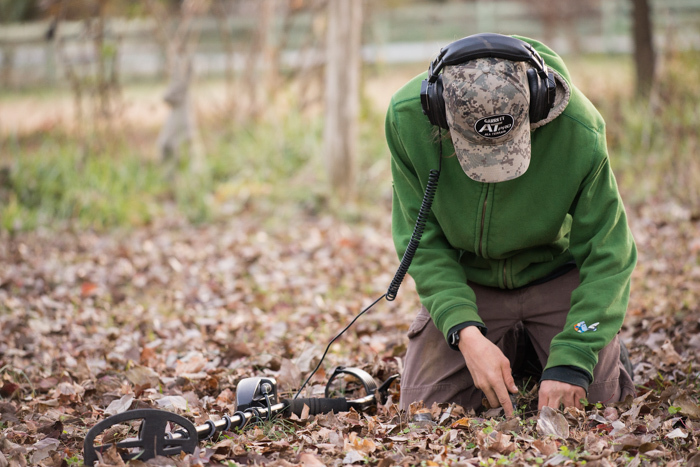 We live in northern Virginia and have a metal detector also. My husband and son (also 14) are always wondering where they can legally go and search for treasures. Glad that Seth is having such a great time! I wonder if the unknown relic is an old Roman coin – I think “COS III” on the right side means Consul Tertium, or that the person was Consul for the third time. Hope that helps! That is a big collection! I think you need to start hunting up a nice old set of museum drawers so you can keep them tidy, condensed and protected. Start looking at garage sales! Wow!! What an awesome hobby! I loved the Spanish pistareen- very neat to see! And the Colt pocket revolver-so cool! 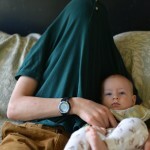 My son will enjoy this post! Thanks for sharing Seth! You have a most interesting hobby! The thing that fascinates me is how much metal history you have to explore in your area. The old coins are just unbelievable. Also, we do not have such a common occurance of buried Civil War artifacts in Oklahoma, and as you can imagine. 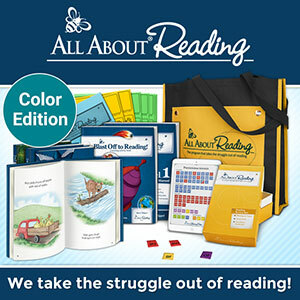 As students, we obviously learned about the Civil War, but most of us never had the opportunity to actually dig up artifacts to bring that history to life. Seeing photos in a book is so much different than seeing or touching war relics in person. I can imagine that you are able to appreciate that part of American history much more than someone who hasn’t had that experience. Of course, there is much buried history in Oklahoma. Many of the artifacts unburied here include things such as arrowheads, beads, pottery, and items that white settlers would have brought with them when opening the west. It is a very interesting history, but it is a much different history than what you are uncovering. Thank you for sharing your finds with us. I hope you will post again soon! We live on the site of an old fort built by the Prince family hence our area is referred to as Fort Prince. Our youngest son’s Father-in-law is an avid metal detector user and has found some great items in our neighborhood. There are things to find everywhere. Detroit is a very old city ( founded in 1701 ) so I think you could probably find some cool relics and coins there. I loved all of this..I would read your blog!! 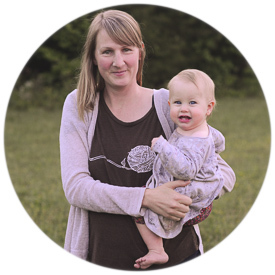 Thank you for sharing your amazing finds! Wow, what an interesting hobby. I absolutely love seeing the cool things that teenage homeschoolers get up to!